Let me just get this out of the way: Norman Van Aken has always been something of an idol of mine. One of my formative food experiences was at his restaurant A Mano, which he opened in the Betsy Ross Hotel on South Beach (now known just as The Betsy) in 1991. 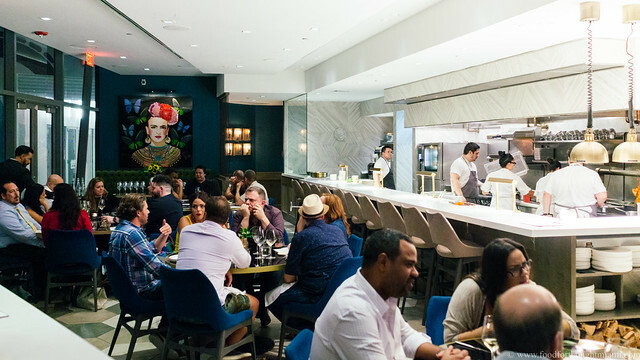 A Mano was Van Aken's first venture in Miami after making a name for himself at Louie's Backyard in Key West, and it was a great restaurant: fancy but not stuffy, bringing classical technique and refinement to the ingredients and flavors of Latin America and the Caribbean. 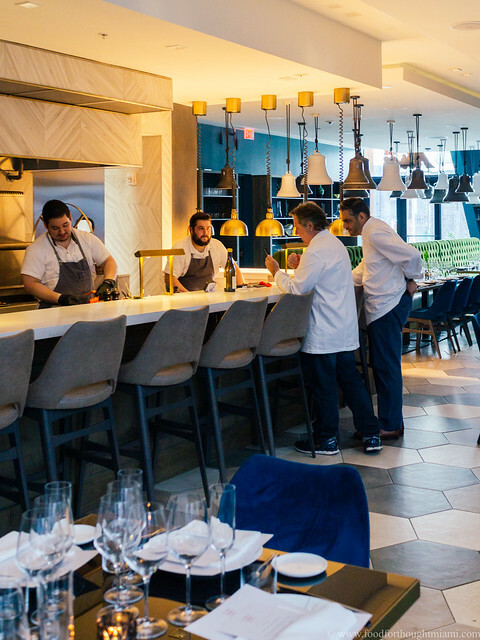 If that sounds old hat now, it's a testament to the influence of Van Aken and several other chefs of that generation who helped to democratize, in a way, what we think of as fine dining. I celebrated my 25th birthday at A Mano the next year, and can still recall the "Down Island French Toast" with seared foie gras and a savory citrus caramel, the massive bone-in ribeye "gaucho" steak studded with slivers of garlic and jalapeño, and a dessert that topped ice cream with bananas cooked in rum and sugar, then laced it all with a spicy-sweet chile jelly. Fresh out of law school and just starting my career, in a position for the first time in my life to really celebrate the joys of good eating on my own dime, this was how I wanted to do it. I went back to Van Aken's restaurants as often as I could – the more modestly priced Stars and Stripes Café in the front of the Betsy Ross more frequently than A Mano, and then later his longtime flagship Norman's in Coral Gables. I bought his cookbooks, and cooked from them. And I followed many of the paths they illuminated – other chefs and writers – along the way learning a good bit of what I know about food now. So how often do you get to ask one of your idols to cook for you? 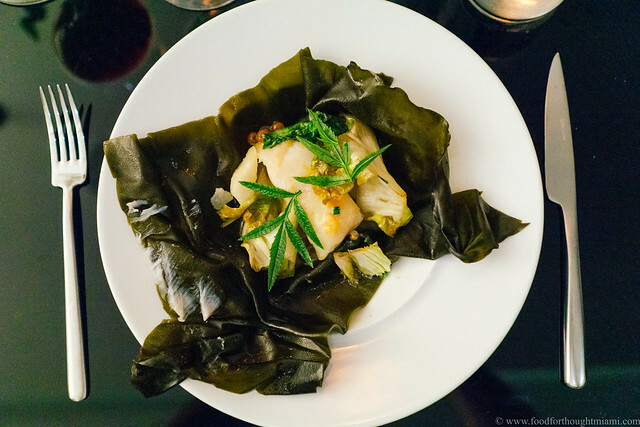 We've been trying for years to make a Cobaya dinner with Norman Van Aken happen. It finally did in late July, and it was worth the wait. 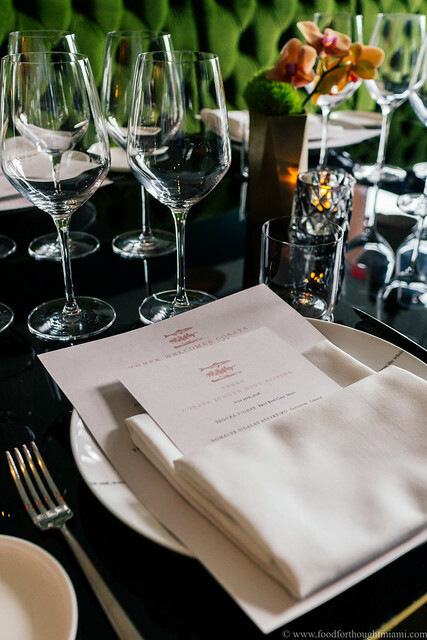 This was a particularly special one for me – another dinner I'll remember for a long time. Here are some notes and pictures. (You can see all my pictures in this Cobaya Three with Norman Van Aken flickr set). Three, in Wynwood, actually may be my favorite of the venues Van Aken has operated since he came up US-1 from Key West. 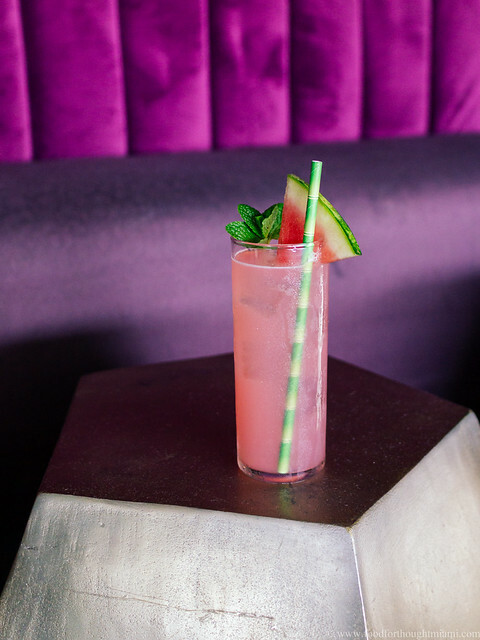 Part of the Wynwood Arcade, it has a dining room that glows with plush, richly hued greens and blues, a long dining counter along the open kitchen, plus a rooftop bar (No. 3 Social) which is where we started the evening. After plying us with cocktails – a choice of the "Hit the Deck" with vodka, habanero syrup, watermelon and mint, or the "Norman's Revenge" with tequila, lime, jalapeño and a black salt rim – we were led back downstairs to the dining room, which we'd taken over for the evening. 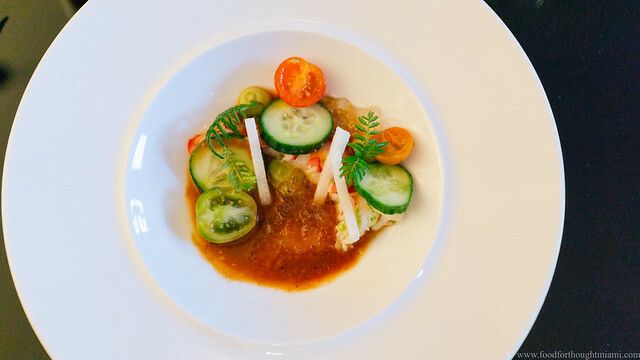 We started with a dish inspired by a classic Mexican hangover cure, "Vuelve a la Vida," a ceviche-style seafood salad with supposedly restorative powers. This one was more refined than most, combining a chilled lobster tail, a cocktail-sauce like spicy tomato dressing, a mezcal gelée (a little hair of the dog), avocado purée, and fresh cherry tomatoes, cucumbers and crunchy jicama batons. 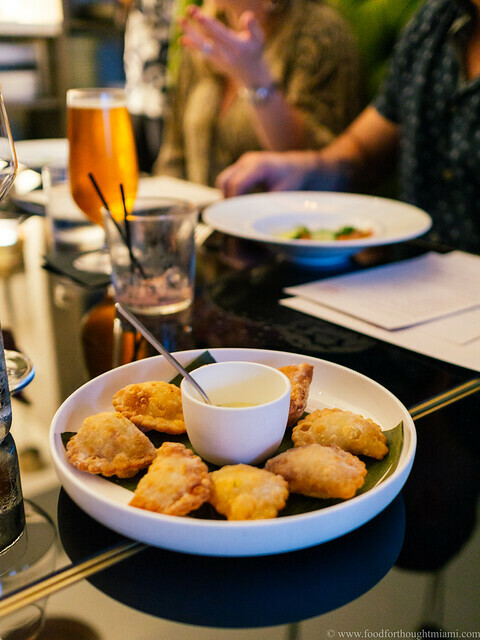 Some crispy empanadas rode along sidecar. 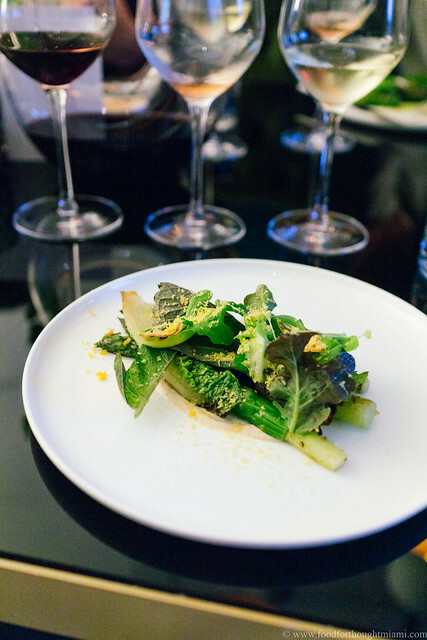 I loved the next dish, which put together fat, flavorful grilled asparagus spears, wispy garden lettuces, a smoked benne seed dressing, and shavings of preserved citrus. 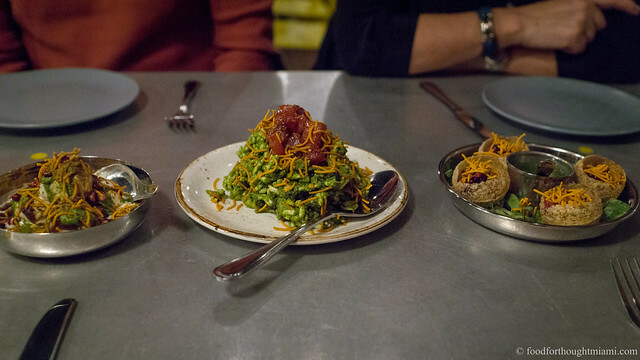 It's not always easy to give depth of flavor to vegetable dishes, but this one accomplished it. This was my personal dish of the night, and a testament to what happens when you stop worrying about "authenticity" and start playing around with exciting flavors. 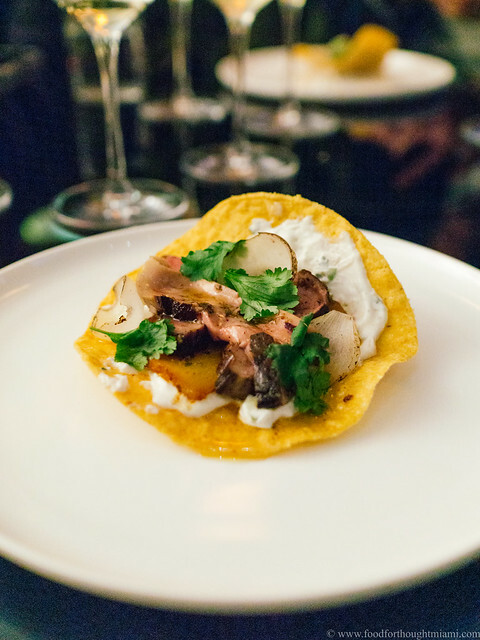 A whole lobe of foie gras was rubbed in shawarma spices and grilled over wood fire, then paired up with grilled pineapples "al pastor" style, petals of grilled pearl onions, and a tangy shishito kosho yogurt, all wrapped up in a crispy flatbread. You could try to trace the history of al pastor style meat cooked on a vertical spit from the Middle East to Mexico, and wonder how you got re-routed through Japan along the way; or you could just accept that this is a flat-out delicious combination and not worry too much about how it found its way onto one plate. If the foie gras shouted, the next course cooed: sweet, meaty yellowedge grouper, cooked wrapped in seaweed along with miso-baked hakurei turnips, then napped with meyer lemon bonito butter, a dollop of salmon roe, and kinome leaves. The final savory round was another of my favorite dishes of the night, a sort of spin on Hainanese chicken rice. But where the typical iteration of that dish involves a whole chicken poached or steamed with garlic and ginger, rice cooked in the chicken broth, and a chili-garlic sauce served on the side to perk everything up, Van Aken took some liberties. The birds – gorgeous Green Circle chickens – were dry-aged, then generously brushed with a fermented pepper sauce and cooked slowly over open flame (here is Three chef de cuisine Juan Garrido's shot of the birds hanging over the fire), bringing the spice in earlier and concentrating the birds' flavor. A long tranche of the birds' breast was plated with the chicken-broth infused rice, all laced with the chili-infused chicken drippings, plus a little lagniappe: a "super chicken arepa" of pulled chicken meat, guasacaca, grilled corn butter and pickled onions. Desserts featured a duo from Three's talented pastry chef Mame Sow, who showed she can hit the treble notes as well as the bass. 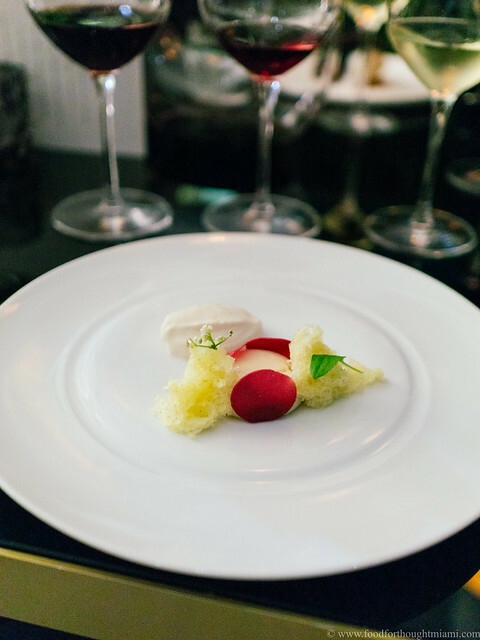 One, an intriguing combination of baobab mousse, hibiscus curd, fluffy yogurt cake and a honey-lavender cream, was all floral, citrusy lightness and delicacy. 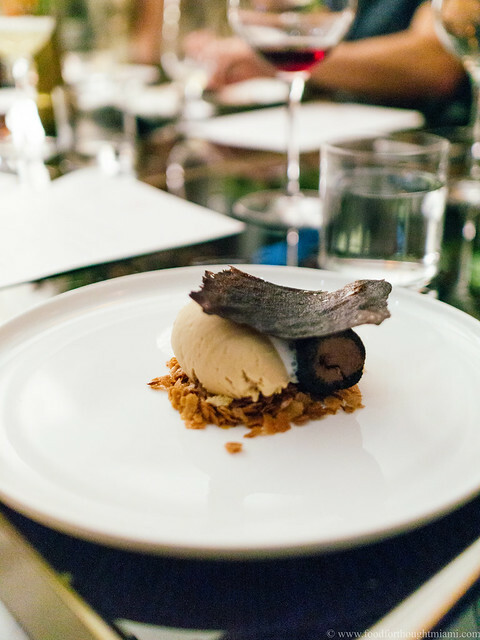 The deep notes came with a combination of devil's food cake, rich guanaja chocolate cremeux, roasted white chocolate ice cream, and a frothy milk espuma. I've already acknowledged my biases, so while I hope and think this was a great dinner for all our guests, it was an especially meaningful one for me. A very heartfelt thank you to Chef Van Aken, to Jeffrey Brana, to Three CDC Juan Garrido, pastry chef Mame Sow, GM Brian Diaz, and the entire crew at Three who made this a really special night. After the dinner, as the night was winding to a close, Norman and a couple of us were speaking about some of the food world's recent losses: Bourdain, and then Jonathan Gold (the latter only days before our dinner). And it got me thinking about the idea of "legacy" – what is it that we leave behind when we're all done with this world? Early in life, if we're thinking about our legacy at all, many of us think it's about recognition for our achievements: fame, success, notoriety, wealth, awards. Norman Van Aken has collected plenty of awards, and achieved plenty of fame. 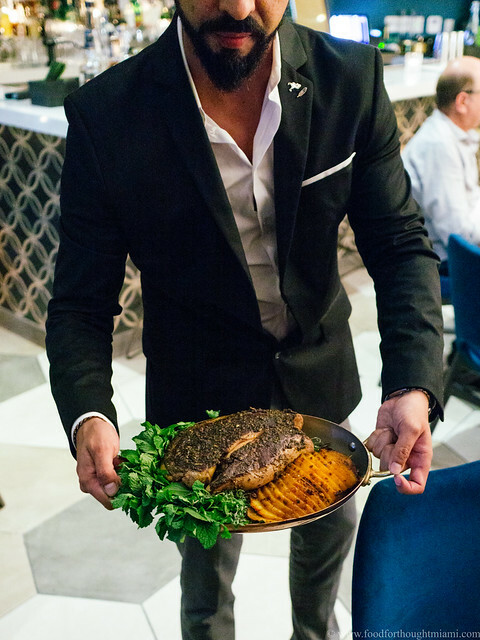 He won the James Beard Foundation's Best Chef Southeast award in 1997 after first being nominated in 1993, and is the only Floridian included in the Foundation's "Who's Who of Food & Beverage in America." As best I can tell, Norman's Coral Gables is the only Florida restaurant to have been a nominee for the nationwide categories of Best New Restaurant (when it opened in 1996), and Outstanding Restaurant (in 2005). 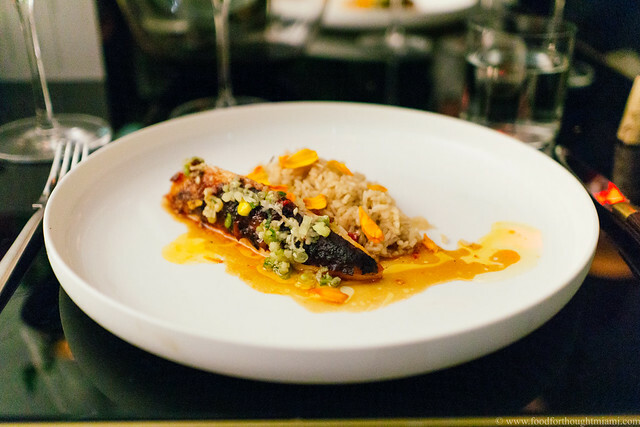 I don't think it's any exaggeration to say that Norman Van Aken put Miami on the map not only as a tourist destination, but as a culinary destination. But as we get older, many of us find that "legacy" is actually something less, and simultaneously also much more: it's the people we have the chance to mentor, teach and inspire. For Van Aken, that's an incredibly long list that includes both several other lauded next-generation chefs and many more industry folks you may never have heard of, but who learned to approach the job with the right mindset, skill set, discipline, and above all, spirit. It also includes countless diners like myself who may have been motivated to learn more, experience more, or just enjoy more as a result of a special meal. I hope that maybe we were able to help Norman and his crew inspire a few others with this dinner. These days, it can and should be debated whether "democratize" or "appropriate" is the right word to use here. On one hand, these are the flavors of cultures and communities that previously had virtually no representation in the world of fine dining. On the other, they were being brought there almost entirely by white male chefs, who then reap the profits therefrom, not the people who actually created those cuisines. Two decades later, the same patterns – and same debates – continue to play themselves out. I don't have any simple answer, other than that which is done in good faith, and with acknowledgment and respect for its sources, ought to be recognized as such (and vice versa). I'd happily eat that whole menu tomorrow. It's more intimate than A Mano, less stodgy than Norman's Coral Gables, less chaotic than Mundo, more lively than Norman's 180. Peru has its own versions as well. Note the "frenching" on the bottom of the stalks to remove the tough, woody parts. I feel the influence of Jeffrey Brana in this dish, a long-time cohort of Van Aken's who has a masterful touch with vegetables, and who lent a helping hand with this dinner. A sort of Venezuelan avocado salsa verde. The fruit of the baobab tree is among the latest crop of supposed "superfoods." Someday, someone will explain to me why the Beard Foundation uses "semifinalist" to describe the initial round of nominees for awards, and the underwhelming-sounding "nominee" – rather than "finalist" – for the second cut before selecting a winner. It includes folks like Nina Compton, herself a recent Beard winner for her wonderful Compere Lapin in New Orleans; Michael Beltran, of Ariete in Coconut Grove; Max Santiago, who started The Salty Donut and has moved on to run pastry programs for multiple restaurants; the talented Jeffrey Brana; David Bracha, who worked at A Mano back in the day and now runs River Oyster Bar; Alberto Cabrera, who worked at Norman's, went on to open Bread and Butter in Coral Gables (R.I.P. ), and is now planning a new Cuban restaurant in Brickell City Centre plus reopening the David's Cafe ventanita on Lincoln Road; Phillip Bryant and Veronica Valdivia, who had been running The Local in Coral Gables and are now the in-house team at Estancia Culinaria; Mario Pagan, one of Puerto Rico's top chefs; and so many more. If you're looking to get inspired yourself, you can not only have dinner at Three – you can take cooking classes at In The Kitchen next door, where Van Aken, Brana and others provide hands-on courses for home cooks of all levels of experience. 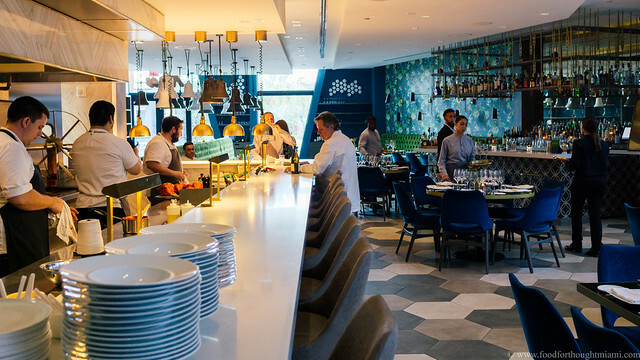 The cooking school was actually the original impetus for the Wynwood project (which Van Aken was initially going to open in a project adjacent to the Vagabond Hotel on Biscayne Boulevard, but which got bogged down in construction delays); the restaurant was an add-on.